Today we have a post aimed at encouraging wind, brass and percussion players to make more of our special collections. Whilst it’s true that much of the collections comprise voice and string-based repertoire, this is by no means exclusively the case. So, here are some choice picks to help you explore further (NB non-WBP players may also find something of interest here!). The Bridge Memorial Library (the historic library of the former Trinity College of Music) is full of rare and unusual printed music from the classical and romantic periods. Of relevance here, there are several out-of-print works of chamber music involving wind or brass instruments. 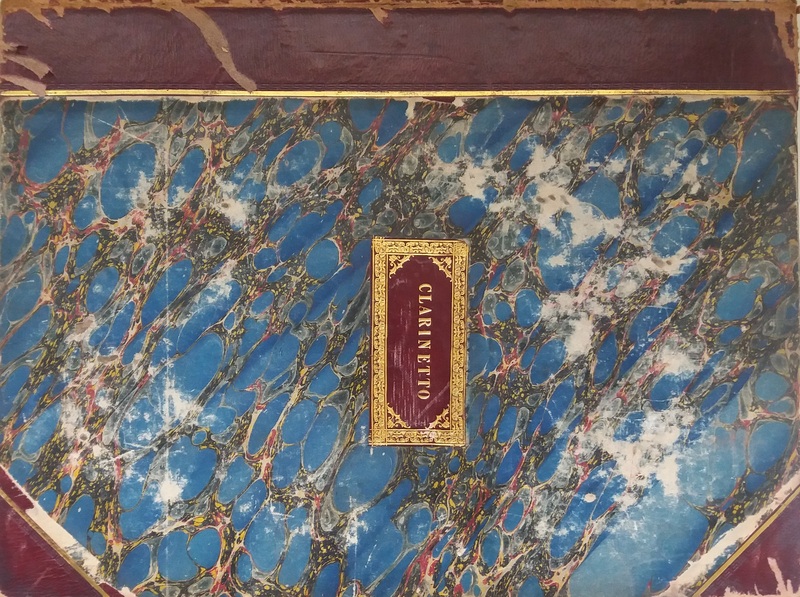 For instance, we have a set of quartets by C. F. Baumgarten for oboe and strings – we featured them a few years ago in this blog post here. Then there is Henri Brod’s Cinquième Fantaisie for piano, oboe and bassoon. Or how about Reissiger’s Vier Gesänge for soprano, horn and piano. Clarinettists may want to delve into this volume of trios, originally for various different instrument combinations but bound together clearly with the intention of being played by a clarinet trio. It even includes some manuscript arrangements for the clarinet part – a great insight into nineteenth-century performance practice. We also hold first or early editions of better-known works, useful for comparing with performance directions in later editions. 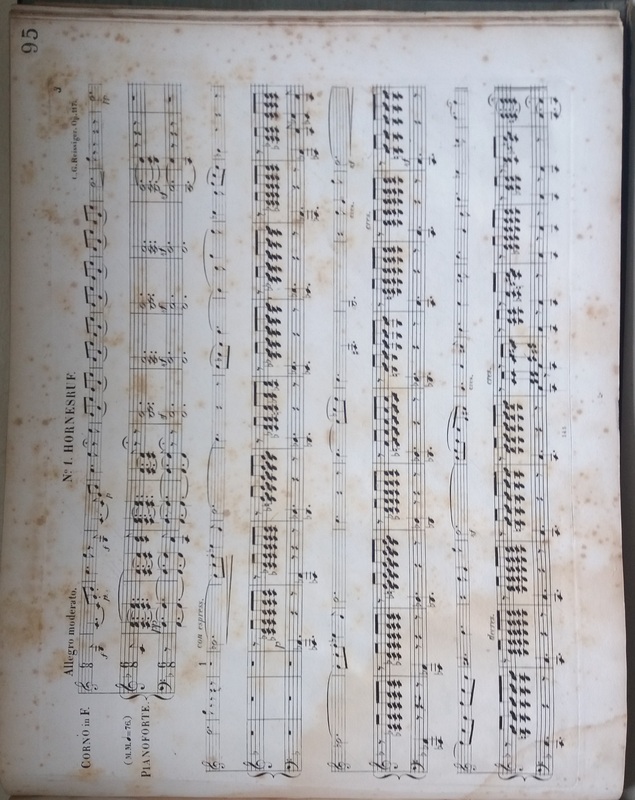 For instance, see this 1820s edition of Spohr’s Octet. As well as rare printed music we also hold many unique manuscript scores of works written for wind, brass or percussion instruments. Several of these can be found in our Carey Blyton collection which came to us in 2006. Blyton was a former TL student and professor, and a prolific composer. Relevant items include a brass quintet, woodwind trio and song cycle for voice, clarinet, horn and piano. Another manuscript by one of our former composition professors is Arnold Cooke’s autograph score of Divertimento for flute, oboe, violin, cello and piano (or harpsichord). Cooke taught at the conservatoire between 1947 and 1978. Lastly, so as not to neglect our percussionists, there are the three autograph manuscript scores by Simon Bainbridge, David Bedford, and John Woolrich which together comprise Songs, Sketches and Tall Stories, a work for narrator, clarinet, piano and percussion. This was composed for a schools music theatre project at Blackheath Concert Halls (now owned by Trinity Laban) in March 1989. If you’d like to discover more, all our special collections are described here on our website. And many collections are catalogued at item level on our catalogue. When you’ve found something you’d like to see, please contact us to make an appointment so we can have the material ready for you. Our special collections are available to all researchers, whether members of Trinity Laban or not. Please note that copies can only be made in compliance with copyright law – we can advise on specific items.